10-production-managers – Feist Cabinets and Woodworks, Inc.
Feist Cabinets manufactures custom residential and commercial cabinets that are designed, built and installed to meet the needs of our clients. If you're an existing client we would love if you would share your experience using Feist Cabinets by writing a review. Thank you. 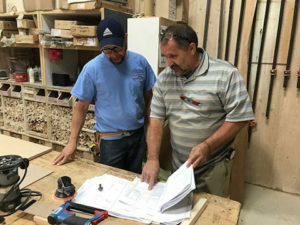 The Feist Cabinets design team has 80+ years of combined experience; our core plant and installation crews have been with us since the early 90’s. Our specialties are custom residential and commercial cabinets that are designed, built and installed to meet the needs of our clients. Feist Cabinets manufactures custom cabinet packages in different wood species and price ranges, with options for stained or painted finishes or unfinished, complete installation, delivery only or will-call from our plant. We specialize in cabinetry for kitchens, bathrooms, livingrooms, winerooms, closets, and for commercial uses. Greater Sacramento Area including: Sacramento, Roseville, Rocklin, Lincoln, Granite Bay, Folsom, Placerville, Shingle Springs, El Dorado Hills, Orangevale, Fair Oaks, Carmichael, Rancho Cordova, Citrus Heights, Natomas, Jackson, & Elk Grove. We also travel to outlying areas between Lake Tahoe and San Francisco.